This carving set was made for commission. The handles are cast pewter and the blades are tooled 1075 carbon steel. 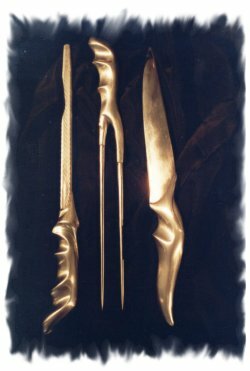 The blades and fork were made first then the handles cast on. the handles have a comfortable ergonomic design to fit in the hand, and the pewter handles give a soft warm feel. This would make a quite unique and stunning addition to your kitchen or dining room.